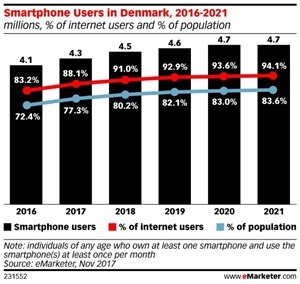 Denmark, with a penetration rate of over 77% among the general population, will boast the highest rate of smartphone usage in the world this year according to eMarketer’s worldwide mobile forecast. High smartphone penetration rates are a common theme in Scandinavia, which as a region is widely known to have wealthy, digitally advanced populations. 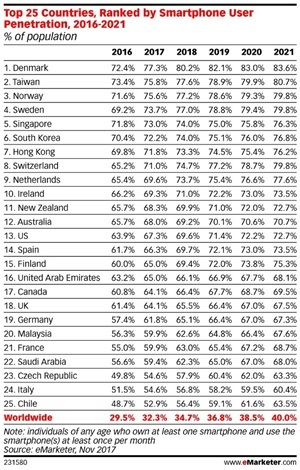 In 2017, more than three-quarters of the population of Norway will be smartphone users, while Sweden will be just below 74% – ranking them as third and fourth in the world respectively. On a global scale, this year eMarketer estimates that almost a third of the global population—2.39 billion people—will use a smartphone. In the 10 years since the iPhone first came on the market, smartphones have morphed from being an expensive item favored by tech fans to a commodity device that is surpassing desktops as the primary platform to get online. According to eMarketer’s forecast, the biggest surges in smartphone adoption this year will take place in India and Vietnam, with each country’s user base expected to expand by almost 20%. Strong growth in developing countries, coupled with heavy adoption in populous countries such as China and India, means that smartphone users now account for more than half of all mobile phone users worldwide.